Oca is the name given to the typical Brazilian indigenous housing. The term comes from the Tupi-Guarani language family. The ocas are buildings of big dimension, and may reach 40 m in length. They are built through joint effort over one week, with a wooden structure and bamboo and straw cover or palm leaves. They can last 15 years. They have no internal divisions or windows, only a few doors and serve as collective housing for several families. COP8/MOP3, 16 March 2003. Amanhã, cerimônia ao pôr do sol inaugura ocas Xavante, by Marina Koçouski. ^ "Conhecendo uma oca". Sua Pesquisa (in Portuguese). Retrieved 8 October 2016. ^ "Diferentes Moradias" (PDF). Educacional (in Portuguese). Retrieved 13 October 2016. 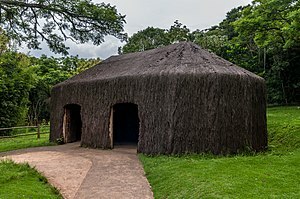 This article about a Brazilian building or structure is a stub. You can help Wikipedia by expanding it.